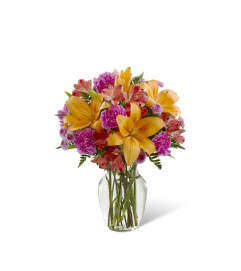 Purples in shades from pale pastels to plum pop perfectly among green alstroemeria and white daisy poms. For any Mom that has a passion for the calming, peaceful, mysteries of purple, this bouquet is made to order and is sure to be long-remembered. 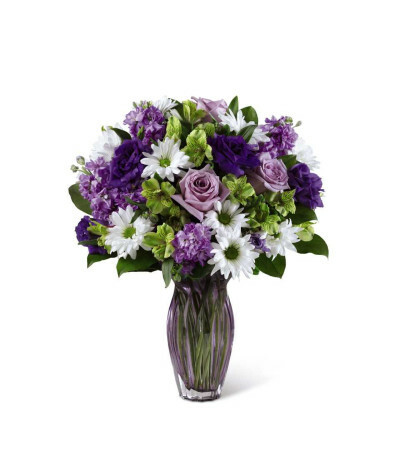 This brilliant gathering of stock, lisianthus, daisy poms, roses (in Better, Best and Exquisite) is hand-arranged by an FTD artisan florist in a heavy, lilac-hued heirloom quality glass vase and makes an outstanding way to endow any day with "special occasion" status. 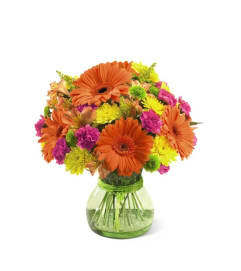 BETTER bouquet is approximately 17"H x 14"W.